Super-smart Donnie is very serious about the things he wants: the first is a copy of Giant-Size X-Men #1, the only comic book that his father doesn’t have in his collection. The second is a computer, so he can work on his own graphic novel project, Schemata. As for the third, you’ll have to sort that out on your own! Donnie is 15, living in the basement in the house he shares with his pregnant mother and so-called step-fascist, the man she left Donnie’s father for. School is a battlefield: he’s bullied constantly, and has only one friend, Cal. Cal’s on the lacrosse team and hangs out with the jocks, so sometimes he has to pretend that he’s not really Donnie’s friend. All he really has to keep him going is his graphic novel and what he calls “The List”: a mental catalog of everyone who has ever hurt him, so that he can seek revenge someday. (Just to be clear, here, he may fantasize about hurting those who have hurt him, but he affirms that “the best revenge is living well”, and is determined to make it big someday, rather than act out in violence). He’s being beaten (again) in gym when Kyra shows up. She’s pale, dressed in black, with piercings and an attitude that proclaims, ” I hate you all”. Soon the duo become unlikely friends, driving around in a series of (possibly) stolen cars, talking about suicide, school, comic books, and how they’ve been let down by the adults in their lives. She teaches him how to stand up to people, and when Kyra needs help, Donnie uses what he learned to save her life. High school isn’t an easy place for many people, and this book explores how painful social isolation can be. Donnie’s voice is believable, and readers will be instantly sympathetic to him. Kyra’s set-up can be a little awkward in places, such as the unexplored thread about the stolen cars, and I felt the exchanges with the principal were not terribly realistic. But, you know what? This is fiction, after all. It’s a story. It’s ok to have some elements that may or may not happen in real life. That’s part of storytelling! Fans of comic books, graphic novels (though don’t get confused, this isn’t a graphic novel, it is just about them), and anyone who has ever felt like an outsider will appreciate this book, I think. My very favorite parts were where the author, Barry Lyga, would slip into using this unique imagery. It was almost poetic, and I was so surprised and pleased to see it included. For example: “And now the laughter takes on a slightly dark tinge, a bad flavor, as if dipped in a solution containing the slightest percentage of vinegar.” Nice, right? It really reminded me of Fat Kid Rules the World by K. L. Going, so if you liked that one, I think you will like this one, too! There’s also a sequel, Goth Girl Rising, but do you know what I would really like to see? I want to see the real-life version of the graphic novel that Donnie is working on in the book. It sounds great! Lyga, Barry. 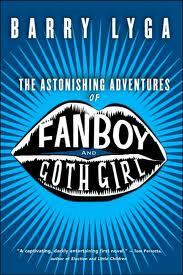 The Astonishing Adventures of Fanboy and Goth Girl. Houghton Mifflin: New York, 2006. 311 pp. Ages 15 and up. Hey, can I say one more thing that I loved about this book? I’m pretty happy to see several characters in it that don’t drink. For example, Cal tells Donnie how to spill his beer a little into the plant at the party, because neither of them really want to drink. Thanks for that! Also, watch out for my next post on Please Ignore Vera Dietz by A. S. King. Since I started library school, I’ve been really nervous and a little homesick, and reading and blogging help me feel better! Soooo, it should be up soon! Posted on September 14, 2011 by ShannaPosted in ALA/YALSA Best Fiction for Young Adults, Realistic Fiction, YA LitTagged Barry Lyga, blended families, bullying, Comic book, comic books, Comics, coming of age, counterculture, graphic novels, high school, suicide. Oh, I’m so glad you loved this book! Goth Girl Rising is the second of the series, written by Barry Lyga. I was able to find a copy on Amazon, so we know it’s still in print-good news! I bet your friendly local librarian would be happy to help you find a copy.